A journey around Europe: Stories to inspire your life of travel. Fiesole, Italy – A small town located 30 minutes north of Florence is easy to travel to by bus. Lauren (one of my roommates) and I took a day trip to this quiet town to explore the hills of tuscany. Upon arrival, we stepped off the bus in the city’s square, which was smaller than any square in Florence. It seemed as though the town was deserted since the only people we saw were those getting off the bus with us. As we made our way along the windy main road, we found ourselves practically scaling the buildings as the sidewalks barely existed. We reached some amazing views of the hills and could see for miles since Fiesole lies at the very top of a (Tuscan) hill. Both sides of the city looked onto beautiful views; at one overlook, we were able to see the entire city of Florence. 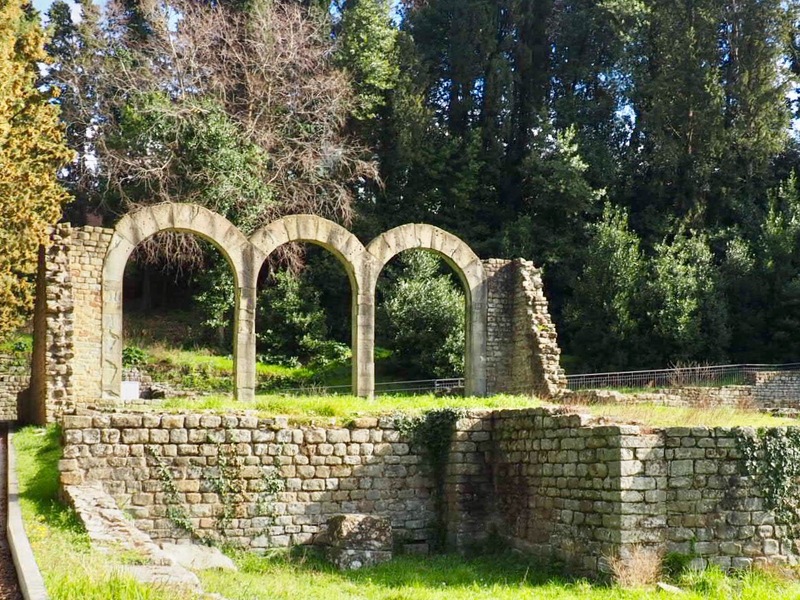 One of the most popular sites in Fiesole is the Archeological Area. Within the area, there are a couple museums and ancient ruins including: thermal baths, temple remains, and an amphitheater. Thermal Baths – Built in the 1st century BC, three of these thermal baths were created for the Romans to enjoy. The temperature of water varied among the three baths, and each one held a different purpose. 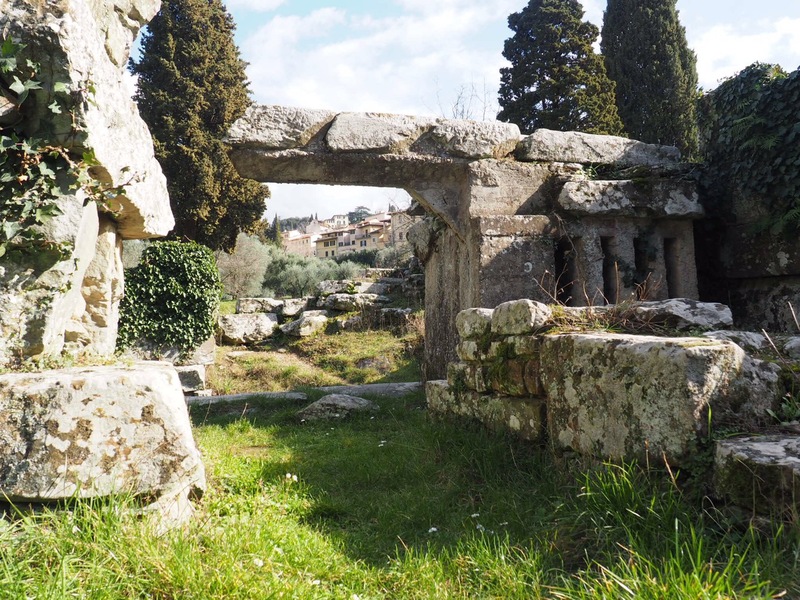 Temple – Serving as both an etruscan temple (6th century BC) and a roman temple (4th century BC), some of these ancient ruins are still preserved today. Archeologists suspect the etruscan temple was destroyed and later built on top of to construct the roman temple. The staircase shown below led to a sacred room used for worship and other rooms served as storages as well as an altar room. The temple was likely destroyed by a fire in the 1st century BC. Used until Longobards (the long beards) arrived at the end of the 6th century AD; the temple site was then turned into a burial ground. Many of these graves were discovered in the early 1900s and goods made of iron, glass, bronze and baked clay were found inside the burials. Roman Amphitheater – Used for orchestra and theatrical performances, this Roman Theatre was built between the 1st century BC and 1st century AD. Its ruins had been visible for many centuries and was eventually uncovered in the late 1800s. Seen in the picture below is an underground passage that led to a covered gallery (a total of four passages still remain intact on either side of the amphitheater). Although the passages don’t lead anywhere now, they are pretty neat structures to view.